So many times, I find myself wandering to the refrigerator looking for something to eat...it's almost a mindless habit. Once I'm there perusing my food options, it's nice to have healthy options staring at me instead of chips, crackers, and cookies. 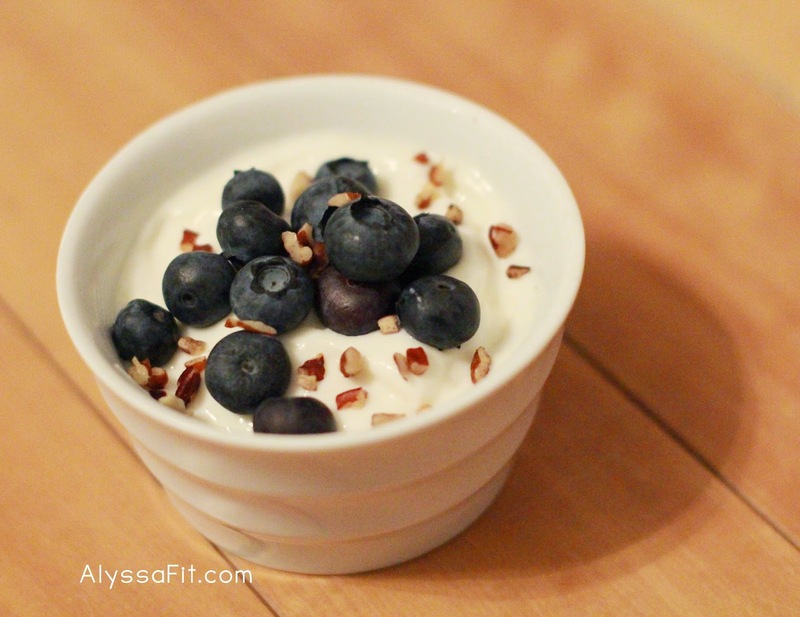 This Greek yogurt snack has been a wonderful healthy alternative! It is perfect for a quick breakfast or a sweet evening snack. If you are not a fan of the taste of Greek yogurt, experiment with different add-ins. Read on for ideas. Easy enough to make in a hurry and very filling! Enjoy! Measure yogurt and add agave. Stir well and add your favorite berry, nuts, or chocolate chips. Enjoy! MORE IDEAS: Try mixing Shakeology or PB2 (powdered peanut butter) in with yogurt for a smooth mousse and garnish with chocolate chips. Mix with mashed bananas and pecans. What's your favorite?